CONGREGATION IN THE COMMUNITY. By 1864. EMMA TRACY RHINE STARTED THE FIRST PRIVATE SCHOOL IN EAGLE LAKE. THE ONE ROOM SCHOOLHOUSE SERVED AS THE FIRST CHURCH MEETING HOUSE IN 1872, WHEN CIRCUIT RIDER ORCENETH FISHER ORGANIZED A METHODIST CHURCH AND SUNDAY SCHOOL. EMMA RHINE ORGANIZED THE FIRST LADIES AID SOCIETY IN THE SAME YEAR, ESTABLISHING A TRADITION OF WOMENS GROUPS IN THE CHURCH. THE METHODISTS MET IN THE SCHOOLHOUSE UNTIL 1880, WHEN THE COMMUNITY BUILT A UNION CHURCH. THE METHODIST, BAPTIST, EPISCOPALIANS AND CHRISTIAN CONGREGATIONS SHARED THE FACILITY UNTIL EACH COULD BUILD ITS OWN SANCTUARY. IN MAY 1899, J.K. DAVIDSON, JAMES A HARBERT, R.B .DOBBINS AND W.Y.WESTMORELAND, TRUSTEES OF THE METHODIST EPISCOPAL CHURCH SOUTH, BOUGHT LAND ON LAKE STREET. THE REV.R.E.NUNN DIRECTED THE CONSTRUCTION OF A BRICK SANCTUARY AND A PARSONAGE. IN 1939, JOHN AND OTRERA (FUSSELL) COLLY DONATED LAND AND MONEY FOR A NEW METHODIST CHRCH, NAMED COLLY MEMORIAL METHODIST CHURCH IN MEMORY OF THEIR 17 YEAR-OLD-DAUGHTER BOBBY. SHE DIED THE YEAR BEFORE BY ELECTRODUCTION IN A SWIMMING POOL; A STAINED GLASS WINDOW BEHIND THE ALTAR WAS GIVEN IN MEMORY OF A.W.BRAUN, WHO DIED TRYING TO SAVE HER. THE CHURCH FACILITIES ESPANDED WITH EDUCATIONAL BUILDINGS AND A NEW PARSONAGE. 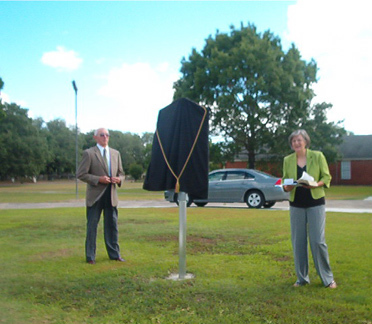 The Eagle Lake United Methodist Church dedicated a historical marker from the State of Texas on June 11. Pictured are members of the Methodist Historical Committee. 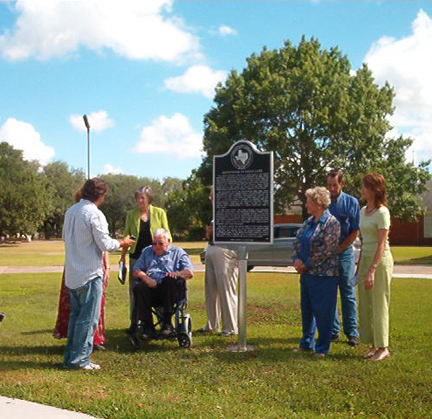 Left of the marker, standing, from left, Anna Lee Higgins, Pastor Ardie Nelson, and Victor Scott. Seated is Henry Sunderman. Right of the marker, from left are Harold Raabe, Elfe Thomas, and Anna Gertson. 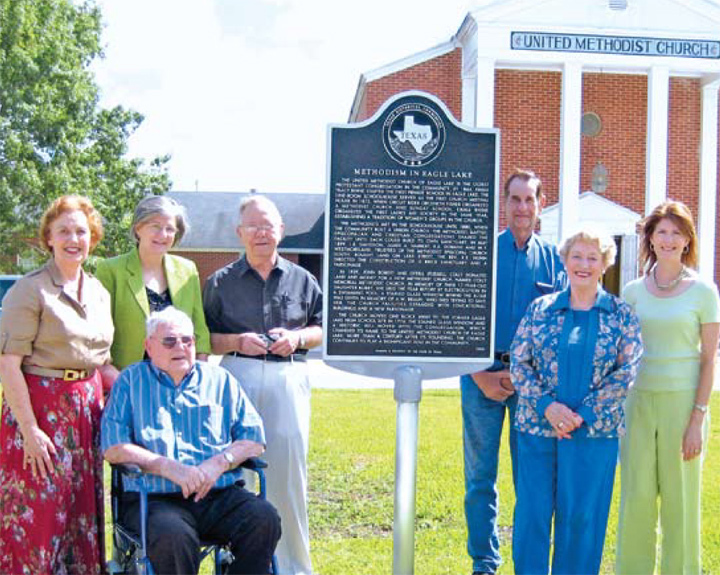 In an unveiling ceremony on Wednesday, June 11, the United Methodist Church of Eagle Lake dedicated a historical marker from the State of Texas. Following is information on the history of the United Methodist Church of Eagle Lake. The United Methodist Church of Eagle Lake is the oldest Protestant Congregation in the community. By 1864, Emma Tracy Rhine started the first private school in Eagle Lake. The one room schoolhouse served as the first church meeting house in 1872, when circuit rider Orceneth Fisher organized a Methodist Church and Sunday School. Emma Rhine organized the first Ladies Aid Society in the same year, establishing a tradition of womens groups in the church. The Methodists met in the schoolhouse until 1880, when the community built a Union Church. The Methodist, Baptist, Episcopalians and Christian congregations shared the facility until each could build its own sanctuary. In May 1899, J. K. Davidson, James A. Harbert, R. B. Dobbins and W. Y. Westmoreland, trustees of the Methodist Episcopal Church South, bought land on Lake Street. The Rev. R. E. Nunn directed the construction of a brick sanctuary and a parsonage. 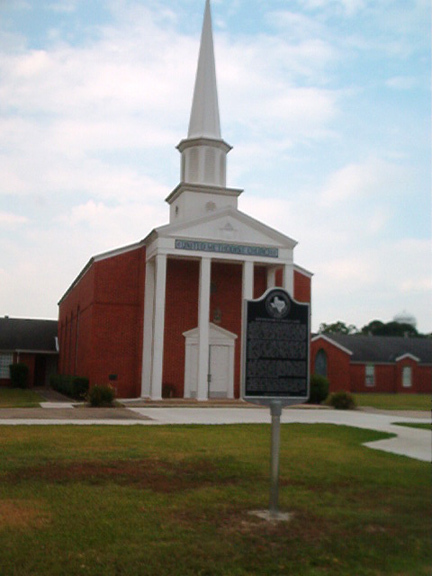 In 1939, John and Orera (Fussell) Colly donated land and money for a new Methodist church, named Colly Memorial Methodist Church in memory of their 17 year-old-daughter, Bobby. She died the year before by electrocution in a swimming pool; a stained glass window behind the altar was given in memory of A. W. Braun, who died trying to save her. The church facilities expanded with educational buildings and a new parsonage. The church moved one block away to the former Eagle Lake School site in 1976. The stained glass window and a historic bell moved with the congregation, which changed its name to the United Methodist Church of Eagle Lake. More than a century after its founding, the church continues to play a significant role in the community. Current Histrorical committee members include Anna Lee Higgins, chairperson; Ann Pavliska, member past and present committee; Ann Gertson, invitation coordinator; Harold Raabe, advisor to committee; Elfe Thomas, secretary coordinator; Don Bendy, advisor to committee; Kathryn Mehner, scrapbook chairperson; Vic Scott, member past and present committee; Ernest Mae Seaholm, historian consultant; and Rev. Ardie Nelson, program chairperson and advisor. Do you have pictures or information about historical markers you would like to share?